Did you know that the song "Happy Birthday to You" is not in the public domain? According to current copyright law, the song's copyright will not expire in the United States until 2030. Public performances of the song without paying royalties are technically illegal, which is why when the waiting staff at chain restaurants serenades you for your birthday, they usually have their own, royalty-free ditty. This might seem a tad ridiculous - especially considering that the song dates back to at least 1912, that the original composers have long since passed away, and the people who filed the copyright didn't even write the song to begin with. But such is the strange realm of U.S. copyright law, which is taken to task in Lewis Hyde's new book, Common as Air. Hyde's central thesis is that cultural objects, such as scientific discoveries and pieces of artistic expression, should exist in a "cultural commons." In feudal Britain, villages once had geographical "commons," where citizens were free to hunt and fish as long as their activities did not disrupt the enjoyment of the area for the rest of society. Hyde proposes that we construct a space like this for cultural commodities - finding a way for our culture to take full advantage of the different works created without monopolizing them. The Argument - A "Cultural Commons"
Hyde begins his book with some of the most egregious examples of copyright law in our country today, which helps to build his argument. This part of the book is perhaps the most effective - it's hard not to feel uneasy as you read how the estate of Martin Luther King Jr. has trademarked the phrase "I Have A Dream," as well as King's likeness. Want to make an educational poster with King's face on it? Want to make a documentary on the civil rights era that quotes "I Have A Dream"? Cough up the dough. The middle part of the book, however, lags a little bit. Here, Hyde examines the actual beliefs of the Founding Fathers, out to prove that their conception of copyright when writing the Constitution is not the same as ours today. His point is valid, but this section seems tangential, more often than not. The Founding Fathers' views on copyright law are interesting from a historical standpoint, but not necessarily all that pertinent to the argument Hyde is attempting to make. Luckily, the book ends with three extremely well-written chapters on the function of creation in society and the necessity of a commons. 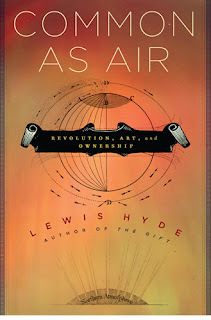 Hyde points out that artists and inventors, contrary to our idealized notions of genius, don't just pull works out of thin air. Rather, people are exposed to different works and ideas, and a true artist pulls these influences together and creates something unique that draws from them. Hyde cites early Bob Dylan tunes that pull from (but not exactly copy) old folk songs. Dylan's work is clearly his own, but his influences are also apparent. The book is certainly engaging, even entertaining, though Hyde (with a degree in comparative literature) does tend to get bogged down in arcane historical arguments and less-than-pertinent quotes. His previous book on creativity, The Gift, left me a little cold, especially with its tendency to lapse into dense passages of literary history only vaguely related to his argument. Common as Air is better than The Gift in this regard, its argument more coherent, and it is certainly more accessible. But, the book's inclination toward quoting these random historical thinkers (Hyde namechecks Heraclitus, Lao-Tzu, and Ralph Waldo Emerson, among others) means that the argument still often feels overly academic, and drier than it could be. At certain times the book seems unable to decide if it wants to be directed toward academics, or for the educated layperson. Hyde's argument is not flawless, and one gets the idea that he is still in the process of forming his idea of the commons. Most of us will certainly agree that cultural treasures like the "I Have A Dream" Speech or "Rhapsody in Blue" should be allowed to be exchanged freely. However, Hyde's idea of the commons, specifically the artistic commons, has not quite fully emerged and it remains more of a concept rather than a fleshed-out proposal. Still, Common as Air is well-written, and treats its subject with a suitable complexity. If you're like me, you've heard trite arguments such as "Information wants to be free" and "Theft is theft, whatever the medium" so many times before that it's nice to read a piece on intellectual property that's a little more nuanced and a little less shrill. It's a shame that Hyde's propensity to indulge in quotes from seemingly-random historical thinkers makes the book a little less accessible than it might be, but it's never a terribly difficult read. Common as Air is certainly an important book for this day and age, and one well worth checking out.